Compression, Extension and Torsion Springs. Custom and from stock. PRICING and CUSTOMER ACCOUNTS are currently being updated. Please call 800-633-7734 TOLL FREE to check prices and order. We love talking to ya! You can price your design or request "similar catalog springs"
5) Email a print or specifications or describe your needs. 1) In general, we find it best to have some idea what OD (Outside diameter) you are looking for. Is the spring a quarter inch or two inches in diameter? The OD is the first group of digits in our part numbers. 2) After that, you should have some idea what the length of the spring might be (with no load on it). Is it a quarter of inch long, or 6 inches long? The Free Length is the second group of numbers in our part numbers. 3) And, last but not least you should have some idea of the loads that you want. Usually, it is best to convert this information into a spring rate. 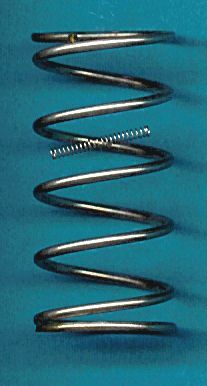 The spring rate is how much force (pounds) it takes to compress the spring one inch. The spring rate is the third group of numbers in our part number. While you may think you don't know this, you probably do have a pretty good idea. Is it going to hold a feather, or an elephant? Does it move 1 inch or one foot when you put the elephant (or the feather) on it? Once you know how far a spring moves under some load, then all you have to do is divide the force by how far it moved. the answer is the spring rate. Fortunately, there are a few tricks here that might be helpfull. First, the free length has a zero load. So if you know it, that's half the job. After that,see below. a) To get a feel for how much load you want, you can take a bathroom scale and press on it. If you have an old spring or a similar spring, you can put it on the scale and press on the spring. This can also give you an idea of how far the spring moved when you were at the load you wanted. b) Another way to get there without a scale is to know something about the loads. Lets say the spring will hold a stack of plates that weigh 1 pound, and you want it to compress 2 inches when the plates are placed on the spring. That is 1 pounds divided by 2 inches or 1/2 or .5 pounds per inch spring rate. a) To get a feel for how much load you want, you can take a "fish" scale and pull on it. You could also use a hanging grocery scale at to the produce department of most markets. If you have an old spring or a similar spring, you can put one end of the spring on the scale and pull on the other end of the spring. This can also give you an idea of how far the spring stretched when you were at the load you wanted. b) Another way to get there without a scale is to know something about the loads. Lets say the spring will hold a fish that weighs 1 pound, and you want it to extend 2 inches when the fish is placed on the spring. That is 1 pounds divided by 2 inches or 1/2 or .5 pounds per inch spring rate. c) Extensions springs can also be "whimpy" or "stiff". Hold the spring sideway by one end and let the other hang. Does the other end sag or stay in place? When you flick the other end with your finger does it snap back or wave around? (We'll ignore the obvious analogies). This is called "initial tension". High initial tensions are stiff, low intial tensions are "whimpy". Although not usually important, initial tensions can have a significant effect on loads. 1) In general, we find it best to have some idea what OD (Outside diameter) you are looking for. Is the spring a quarter inch or two inches in diameter? The OD is the first group of digits in our part numbers. If the ID is of concern, just add 2 wire diameters to the ID to get the OD. 2) After that, you should have some idea what the angle between the legs of the spring will be (with no load on it). If the legs point in the same direction the angle is 0 degrees (or 360 degrees). If the legs point in opposite directions, the angle is 180 degrees. To differentiate betwe 90 degrees and 270 degrees, deflect the spring 90 degrees. If the legs now point in the same direction, the the original angle was 270. If the legs now point in opposite direction then the original angle was 90 degrees. 3) Torsions spring can be either left hand wound, or right hand wound. Sometimes it makes a difference, sometimes not. a) Still, you need to order either right or left hand, or sometimes one of each. b) To determine left hand or right hand, set the spring on a table with the leg on top pointing away from you. Then answer one simply question and you'll know. If the top leg is on the right hand side of the spring, then the spring is right hand would. If it is on the left then the spring is left hand wound. 4) As for loads and spring rate, Torsion springs get a little tricky here. a) For torsions springs the load is a "TORQUE", NOT the weight on a scale. To understand why, think of a childhood see-saw. In order to get it to balance, the heavy child needs to sit closer to the center, and the lighter child further away. So, when the wheight of each child times their distance from the center is the same, the see-saw balances. To calculate TORQUE multiply the load inpounds, by the distance from the center of the spring to the point at which the load is applied. For example if a load of 3 pounds is applied 2 inches from the center, then the torquo is 6 inch pounds. b) OK! We know the torque at some load. But how much does it change as the spring is deflected? That is the spring rate. To calculate the spring rate, just divide the torque by how many revolutions it took to get there. If the spring had been rotated only 90 degree to get the 6 inch pounds torque, the the rate would be 6*(360/90) or 6*4 = 24 inch ound per revolution.